It is hard to believe a movie directed by Bruce Beresford, staring John Cusack and Morgan Freeman is going straight to DVD. That is the case of "The Contract" . A film with high expectations and a twenty five million dollar budget that goes no where. When a father, Ray Keene (John Cusack), feels the need to reconnect with his son (Jaime Anderson), he decides to make a hiking trip. While hiking Ray and his son see two men struggling in the waters of the river. Ray runs quickly to save the two men. As soon as he rescues them, he finds out that one is an injured US Marshall and the other one is Frank Cardin (Morgan Freeman), a paid assassinate and ex-military guns for hire. When Ray Keene finds out who Frank Cardin is, he decides to take him to the police. This is the beginning of a nightmare for Ray and his son as Frank Carden’s men try to rescue him, before they make it to the police. After watching this film, it easy too see why this film went straight to DVD. 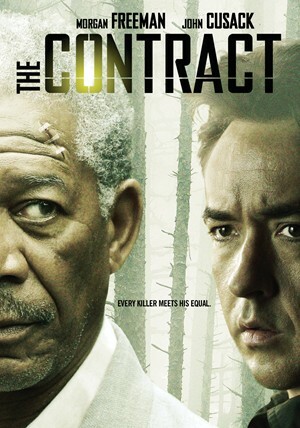 The supporting cast was not the best in the world, giving zero support to the stars John Cusack and Morgan Freeman. There is not a single thrill that can be recalled at the end of the film. Which leads to the conclusion that the script was very bad for a thriller movie. The only positive comments that can be said about " The Contractor" are the cinematography, The scenes around the mountains are spectacular. Also Morgan's Freeman car accident scene was shoot in a unique and original way. At the end, it looks like Morgan Freeman, John Cusack and director Bruce Beresford fell in to the hands of a dead end script without any emotions. Inside The Contract Documentary. A 20 minutes documentary about the film production. featuring director Bruce Beresford, John Cusack and Morgan Freeman.